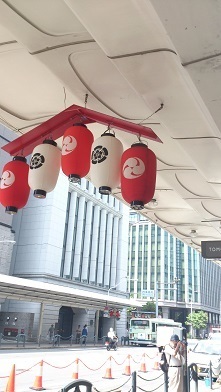 The month of July is beginning and it becomes a seasons in which one can hear various instruments as flutes, drums and dongs at the Gion-bayashi, a traditional music parade. Created in Kyoto, it is the 30th times that it occurs and every year, this parade is entertaining. On the 17th of July, there is another parade which takes place, called the “Yamaboko junko parade. There are lots of “yamahoko” began to stand in the street of Sijo in Kyoto. In japan, there are three big festivals, the “Sandai Matsuri, which various ritual held during the month of July every year. 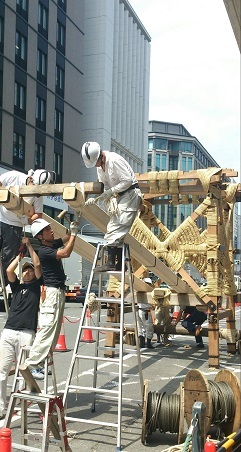 This is a picture of the “Naginatahoko”, which is put up without using a single nail, but only using ropes. Gion festival ritual. There is a meaning in each affair and the inhabitants of Kyoto have inherited and passed down this safety. The LST Company would like to show you the true Kyoto, the one which is still not known to the public.